A curious cockatoo is caught stealing its owner's glasses right off his face, as if it's telling him, "Stop reading and pay attention to me!" The hilarious YouTube video will both make you laugh and capture your heart. In the funny clip, the cockatoo stands on the chair hovering above its owner, watching him as he talks, and eventually moving to his right. 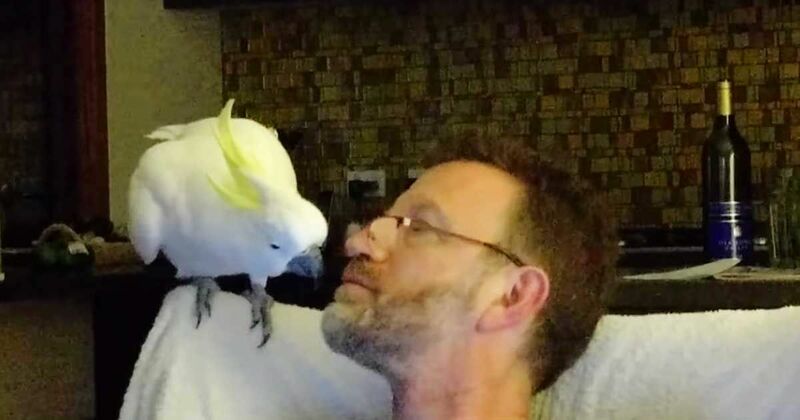 When the man asks for a kiss, the cockatoo leans in and gives it to him, but then the sneaky little bird snatches his glasses and refuses to give them back. The cockatoo grabs the glasses with its beak but moves the glasses between its talons as the man tries to take them back, without much luck. The bird knows if it gives them back, it might lose his attention, so the pretty bird holds on tight and teases him for its own amusement. Eventually, the owner does get his glasses back, only to have them plucked from his head once again! When he finally gets them back for good, his feathery friend isn't all that happy, but the bird continues to play along. The adorable video is just too cute to not see for yourself. So, check out the funny little clip right here below! Don't forget to share this crazy cockatoo video with your friends on Facebook, Twitter and Pinterest! Kramer the cockatoo is one playful bird, and he doesn't need much encouragement from his human to go all out. Roosters aren't often thought of as being friendly and loyal, but Frog the rooster is an exception. His best friend is a 13-year-old girl named Savannah. Because of the weather, poor Eric the cockatoo has been cooped up indoors all day. His owners are about to witness his unbridled rage. Jeff Longo found a small creature left dying on the sidewalk. He knew he couldn't just ignore it.